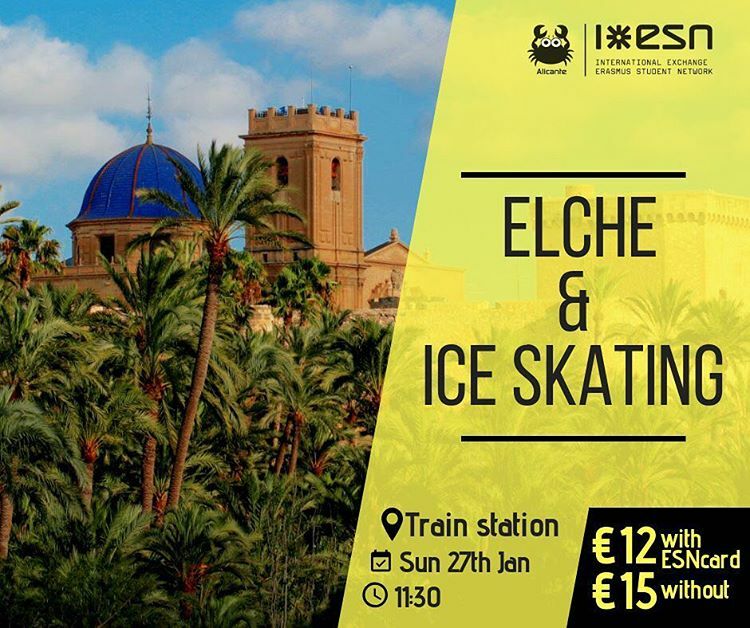 PRECIO: 12€ con ESNcard, 15€ sin ESNcard (incluye ida y vuelta en tren + city tour por el centro de Elche + entrada a la pista de hielo y patines). ¿CÓMO PAGAR? En nuestro horario de oficina, durante las charlas de la universidad o en algunas de las actividades como el TÁNDEM. ¿Te lo vas a perder? ¡¡Seguro que no!! WHEN? On Sunday the 27th of January, at 11:40h in the stairs of the RENFE train station (Avenida Salamanca, 1). The train leaves at 12:00 and waits for no one, so punctuality is recommended. PRICE: 12€ with ESNcard, 15€ without ESNcard (includes round trip by train + city tour through the centre of Elche + entrance to the ice rink and skates). HOW CAN I PAY? In our office hours, during the talks at UNI or even in some of the activities we've organized like the TÁNDEM. Are you gonna miss it? Surely not ! !